Update 2: Daniel just got word that Todd will soon be re-opening the doors to the 90 Day Year program. Update 1: Brand New Private Behind the Scenes 90 Day Year Interview with Todd Herman added below. The 90 Day Year Program by Todd Herman is designed to help entrepreneurs re-shape their business & personal performance through a proven & studied system and process. Todd Herman’s program is specifically designed for those entrepreneurs and business owners who are feeling frustrated with their or their teams’ current level of performance and want to make a change. My name is Daniel Audunsson and my business partner, and I have vast experience with utilizing Todd’s program. This ultimate guide will also act as a personal 90 Day Year review of my experience implementing Todd Herman’s program and system. 2.1 Who is Todd Herman – Founder of The 90 Day Year? 3 Why is the 90 Day Year Program Different? 5 What Comes with Todd Herman’s 90 Day Year System? 11.0.1 What if I don’t live in the United States, can I still participate in the 90 Day Year course? 11.0.2 Is there a Facebook group for the members or the 90 Day Year program? 11.0.3 What type of support is provided with the 90 Day Year program? 11.0.4 Does Todd Herman Have a Live Event for the 90 Day Year Students? 11.0.5 How much does the 90 Day Year Cost? 11.0.6 Can I Buy the 90 Day Year Planner by itself? 11.0.7 If I’m a member of the 90 Day Year where do I log in to the members area? 11.0.8 Is there an app to use when I purchase the 90 Day Year? 11.0.9 Is Todd Herman Offering Any Bonuses When I Purchase the 90 Day Year? 11.0.10 Where can I see a full 90 Day Year program reviews? 11.0.11 How do I know if the 90 Day Year is right for me? 11.0.12 When will Todd Herman be releasing the first pre-launch video for the 90 Day Year free video series? 11.0.13 How do I download the 90 Day Year Oww vs Wow Brain Cheat Sheet? 11.0.14 Do you earn a commission if I buy the 90 Day Year program? 11.0.15 Does the 90 Day Year Workbook only come in a PDF form or can I fill it out on my computer? 11.0.16 What is the 90 Day Year program? 11.0.17 What makes the 90 Day Year different from the 12-week year program? 11.0.18 Did Todd Herman really win the World’s Greatest Salesman Award? If you’re an entrepreneur, nothing is more important than understanding and being able to manage yourself. You can have the greatest business plan in the world, but if you can’t manage and run yourself, you will not be able to manage, run and execute on that plan properly. Today I’m excited to tell you about the best training and system for personal management that I have ever come across, and I have personally been through over a dozen of these – and this is what I use today, every single day, to run myself and run my businesses including my Amazon business. I first met Todd in 2014 while I was in Chicago, Illinois, at a live mastermind event being held by Perry Marshall & Richard Koch. 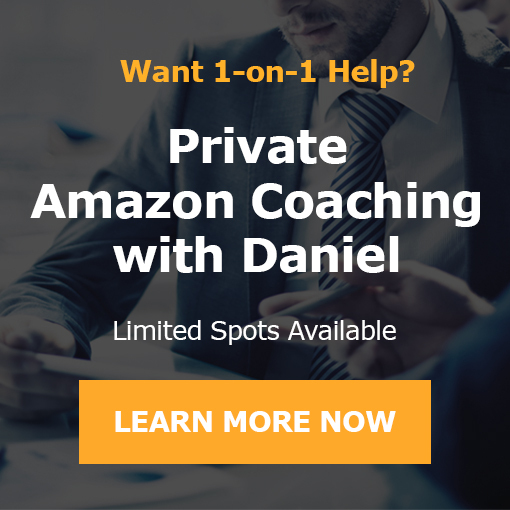 We knew of each other through a few mutual business connections that he was working within the Amazon & eCommerce space. However, we hadn’t had the opportunity to meet yet. Who is Todd Herman – Founder of The 90 Day Year? At the time I didn’t know the extent of Todd’s experience as an athlete as well as a business performance coach and entrepreneur himself. To fill you in Todd has worked with many athletes and actual Olympians, billionaires, high-level business people and world-class businesses, as well as being voted the World’s Greatest Salesperson in 2010. Then in early 2016 he created his first online training program, called The 90 Day Year, to help entrepreneurs achieve mastery in the area of personal management – which I as an entrepreneur know how incredibly important it is to master and that it underpins everything else in your business as well as your life. Because we knew of Todd and he is known in the community of eCommerce entrepreneurs, my business partner Ryan Coisson, and I heard about Todd’s 90 Day Year program and we knew we needed to get access to it. Interested, but I guess not well informed enough about the program, I didn’t actually access and consume any of the content from the course for about six weeks. Maybe you’ve done something like that before as well so you can relate. Being a full-time entrepreneur for about four years now, I have seen my share of personal management programs, such as the classic How To Get Things Done by David Allen, Robin Sharma’s Your Productivity Unleashed Program and more. And while those are all great programs, I thought to myself this would most likely be no different than most of the other personal development programs on this topic out there. Around the middle of February 2016, Ryan flew over to the Philippines for a meeting we had with two partners at the time on an eCommerce brand. We also spent a couple of days working together in person, and one day our conversation shifted to the 90 Day Year program by Todd Herman. We started going through some of the videos inside the course – and from then on out it had my full attention. Within two days I had consumed the entire course and started implementing the system myself, and I have been using Todd’s 90 Day Year program every single day since. It was just that powerful. I’m not sure if I’m supposed to share this yet I want you to see that I’m actually have gone through the 90 Day Year. Why is the 90 Day Year Program Different? First off, the name of the program is important – The 90 Day Year. To begin with, it is scientifically proven that 90 days is the optimal period for planning and that humans cannot efficiently plan further ahead than this. So this is one reason for the 90 days. But the main reason is that it stands for the basic premise of the course which is that if you use this system, you will make more progress in 90 days that most people do in an entire year. It is important to understand how this can be true. And that essentially comes down to proper, results-oriented planning and then placing the proper time, energy and effort into executing on the exact things that matter and move your business forward on those plans. You see, the vast majority of people spend most of their time working but not making progress. You can maybe relate…folks can get caught up in being busy being busy. They spend most of their time on things that are not actually important, procrastinating or simply in a state of confusion, not knowing what they should be doing to move their business forward. Most people would like to spend less time working and make a lot more progress, but they simply do not know how or are not conscious enough of the fact that it is possible to make that happen. We see this a lot when we do personal coaching and consulting. Don’t worry all hope isn’t lost. There is a solution to this. And it lies in a certain set of principles, habits, and personal management techniques – and how to tie them together in one congruent, efficient and very easy to implement system. Watch this video of Todd Herman talking about the 90 Day Year. The 90 Day Year is not some ridiculously large training course that would take you months to go through – in fact, it is a rather short course to go through – but a truly operational system that actually WORKS in real life. A lot of programs have plenty of great theory, and theory is all fine and well, but it does not matter if it is not practical and easily applicable. It needs to be simple and practical enough to use without too much concern or time having to be invested in actually applying the system. This was always a challenge for me with so many of the other methods out there that required massive planning books like Tony Robbins’ Rapid Planning Method (RPM) and Todd has solved that. I feel this is one of Todd’s greatest achievements with The 90 Day Year system – which to me is the first system I have been exposed to that truly succeeds at this, and at the same time is very robust and has every element to it that matters. The 90 Day Year has the perfect solution to putting the theory, techniques and the research behind the program into practical use – and this is what ties the entire system together operationally, and makes it so easy to use and stay on top of – and that is the 90 Day Year Workbook. With the program comes this Workbook, that takes you through an entire 90 Day Year. Todd Herman believes in making his program and company so different that in October 2016 Todd announced that they won the prestigious Stevie Award. Here’s a photo of Todd’s announcement on Facebook. Here are a few photos from the Stevie Awards ceremony with Todd Herman and his wife. It starts with a questionnaire that enables you to analyze your previous progress and current status of your business, and it’s the perfect tool to start using The 90 Day Year for the first time. By answering the questions that are laid out in front of you, you automatically lay the groundwork for the planning that is to come, and is what follows from those questions. This is where you do the actual planning for your 90 Day Year, set your goals for the period and line up all of the action items you need to complete to reach your goal. One thing that is unique about the 90 Day Year system is that it utilizes a proven and increasingly popular approach to planning, execution, and accountability, called the Sprint methodology. This is an agile approach to work, which means that it has a great deal of flexibility to it. It is usually used within teams, where each member takes on a certain role, and the team plans 2-week increments of work with measurable two-week Strategic Performance Indicator goals (SPI’s) and then works in unison to complete the committed tasks for the two week period. Then the team reviews the progress and SPI’s with measurable objective data that is derived from the work and goes over what went bad and what went well, what can be learned from it and so forth. And then finally plans another two weeks of work and commences to focus only on executing the committed tasks during that period, before reviewing progress and repeating the cycle again. Ryan and I have actually used this methodology within our own teams, and it works incredibly well. So this is something that caught my attention immediately, and I had never used this myself for my personal planning and work. Are you ready to join the 90 Day Year? Secure your spot before Todd closes the doors again right here. By utilizing the Sprint methodology, it creates this constant planning and feedback loop, which makes you both organized and fixated on execution, but at the same time flexible and adaptable and in a constant state of reviewing progress and results, and adapting work to reach your goals as you work towards reaching your 90 Day Year goals, which I outline in my 90 Day Year Planner. This is unique and something that I can attest that every other system I have used for my personal planning and management has lacked. This system also creates powerful momentum and motivation as you get more of the RIGHT things done, which leads to great results and growth in your business. From my understanding, Sprint methodology was developed initially for tech startups and software development, as a response to outdated, rigid approaches to work, which simply do not work well anymore and are not in tune with the rapid changes of modern times. This is especially true in online fields of work, such as eCommerce. There are constant changes and developments that we simply must stay on top of and in tune with the trends, or risk falling behind and losing out on opportunities and being beaten by the competition. This system has the modern approach that combats this and allows us to constantly stay on top of our game and focused on results rather than a rigid system that can become outdated quickly. When Ryan and I first started going through the content of the 90 Day Year course, we were at a stage where we had to make a big key decision on how to move forward with one of our businesses. So we went through the Workbook and applied the system, and the questions drastically helped shape the direction of this business, and we discovered many different things we hadn’t thought of or been fully aware of before. It is amazing how by asking the right questions that you may never ask, and thinking about the right things, it can make all the difference and allow you to make much smarter decisions for your business that can obviously have a night and day difference on your results at the end of the day. That being said, these questions and the direction the system provides in your planning is also incredibly valuable. What Comes with Todd Herman’s 90 Day Year System? First, to see a full list of what comes with the June 2017 edition of the 90 Day Year program visit Todd’s official site here. Now in addition to the 90 Day Year Workbook, there is also something called the 90 Day Year Action Planner. This is something that you print out, and it has a Monthly, Weekly, and Daily action sheet. I print this out and use it religiously every day, and what is so great about these sheets is that they contain all the elements of the system on them, so by using them, you cannot miss the elements that matter and it becomes very hard not to do things right. This is one of the things that I love the most about the 90 Day Year, and it is near magic how much this helps me stay focused and on track with my progress and application of the 90 Day Year system. It is from the application of this action planner that the rest of the main benefits of the 90 Day Year program shine through. Todd Herman has recently made an announcement to the 90 Day Year students that they have just created a super durable 90 Day Year Action Planner. The planner contains 3 Removable Tabs/Bookmarks so you can mark the most important pages your working on for. [+] are made of white-boarding material and contain a blank side to them so you can draw, sketch, or brainstorm important ideas. Important Note: This is Action Planner is only available to 90 Day Year Students and isn’t available for commercial sale at this time. 6. You’ll get access to Todd’s special 90 Day Year Planner. Watch a video review of the 90 Day Year Planner here (opens in new window). And remember you are also getting the HUGE 3-Part 90 Day Year Bonus Daniel and I are offering, but it’s limited to the first 25 people. So far I have used up over 300 pages of this planner, and let me tell you why. By applying the planner correctly, you avoid the feeling of overwhelm, guaranteed. Because the way it works is that you plan your work in manageable chunks based on your larger 90 Day Year Plan. You first plan your month, where you can create overarching themes for your work, where you focus in on certain aspects of your business. This could be, for example, systems and processes. Sales funnels. Creating new products. Improving branding. And so forth. You may even create a theme for the entire 90 Days, or just the two-week Sprint, or even just a single day. It doesn’t really matter but what matters is the application of this concept of creating themes that help you be conscious of what you really want to accomplish, right now. Of course, you will have all the action items you want to complete during the 90 Day Year laid in front of you already with the planning you did at the start of it, but you can create these themes within those 90 days that are really fun and very helpful regarding avoiding overwhelm. You simply disregard anything outside your current focus theme and two-week SPI plans (which as you remember, you create every two weeks). Ryan, Todd and I talked extensively about this part of the 90 Day Year in an online workshop we did called Business Olympians. Watch the workshop here and if you’d like to download the slides from the workshop you can do so here. I have also made one personal addition to this system and the 90 Day daily planner, and that is that within the notes section of the planner (which is really empty space for you to put whatever you want inside), I put 5 items that I want to make sure I tick off each day by completing. Here’s a picture with one of my 90 Day Year Planners :-). First, there is PAP, which stands for my “Pro Athlete Protocol”. This is something I learned from Robin Sharma, and it is my personal routine that I start each day with and it includes affirmations I say and questions that I ask myself, meditation I do and visualization. This ensures I start each day off right and get myself grounded, connected to myself and to the vision of what I want to accomplish. Then there is Workout, which means my daily exercise. Third, there is 3 x 90 Min Pro, which means that I want to spend three times 90 minutes each day working only on creative, or pro-active things, with no distractions such as phone or email during those blocks of time. This helps me create the space to complete my Top 3 Goals each day for example. Fourth I have 1 x 60 Min Re, which means the opposite – 60 minutes each day on responding to stuff, or in other words being re-active. Fifth is 1 x 60 Min Learning, which simply means that I want to make sure I spend 60 minutes each day just learning something. Here’s an image that should help give you even more clarity on it. Ready to Join the 90 Day Year? Click on the option below for more details. I could keep on writing about the 90 Day Year program and its’ benefits a whole lot more, but there are really two more points I want to make you aware of as well that I think are immensely valuable about this system. Point #1: would be that by applying the system on a daily basis, you put every single thing on paper that you may want to outsource. As you may know, I am a huge proponent of outsourcing, and it has been a huge part of my business and my success from day one. So to me, this is brilliant. I can simply review my daily planning sheets at the end of each week or month, and find all the things that I spent time on doing myself that I could teach someone else how to do, delegate to them and never have to do that task myself again. Or, to identify things that I am already delegating on a consistent basis, that I could create better systems for so they never actually show up on my daily planner – meaning that it saves me a lot of time and mental space. It is always better to not have to spend time even delegating the things that need to get done, but instead, they just get done automatically as part of the processes you have built for your business. Point #2: I want to mention is that this system truly helps with the “mental toughness” of business. Being an entrepreneur and business is hard, and often it requires you to be very mentally tough, calm and persistent. One thing I can say about entrepreneurship and business is that the winners are those that can remain grounded, focused and persistent with their vision and action even in the face of great obstacles. And by using the 90 Day Year system you will have everything laid out in front of you so clearly that with the daily application of the action planner, you will remain focused and with your eyes on taking the action that really matters even in the face of hardship and things that may scare you – which if you didn’t have a system like this on your side, could easily throw you off track. As someone who truly believes that the 90 Day Year can be something that changes your life, I’ve decided to do something a little bit extra. As part of the 90 Day Year program, Todd Herman is giving you everything you need and some yet I want to do something very special for a few folks like yourself. Here’s what I’m going to do. For only a handful of folks who buy through this link, you’ll receive our massive bonus. All the bonus details are available here. Plus you’ll get the following bonuses from Todd and his team. To make your life a bit easier here are a few of the most common answers to the questions we receive about the 90 Day Year program. What if I don’t live in the United States, can I still participate in the 90 Day Year course? Todd has structured the program to work for folks that live in and out of North America because the program is built on models and frameworks that are in fact universal. The beauty is you’ll have the opportunity to go through the course at your own convenience online. If you can make it to the live calls that come with the program great and if not you’ll have access to the recordings inside the members portal. The best part is you can submit your questions ahead of time so you can get them answered on the live call. Is there a Facebook group for the members or the 90 Day Year program? Yes, Todd has created a powerful Facebook community for the members of the 90 Day Year program. It’s somewhere that you’ll find me as well. Oh and Todd and his team do a wonderful job keeping the group engaged each and every week. What type of support is provided with the 90 Day Year program? Included with the 90 Day Year Todd provides folks with access to an incredibly active and well managed Facebook Group, top of the line support desk and of course the coaching calls that come with the actual training program when you invest in the main training program. The 90 Day Year Playbook edition is more of a do it on your own program. Does Todd Herman Have a Live Event for the 90 Day Year Students? In the past, Todd has done a live event for the 90 Day Year. Currently, the plan is for the live event to be held in either San Diego, CA or in Las Vegas, NV in the spring of 2018. Everyone who joins the 90 Day Year before the cart closes in June 2018 will be able to come to the live event. Here’s the link to join now. How much does the 90 Day Year Cost? 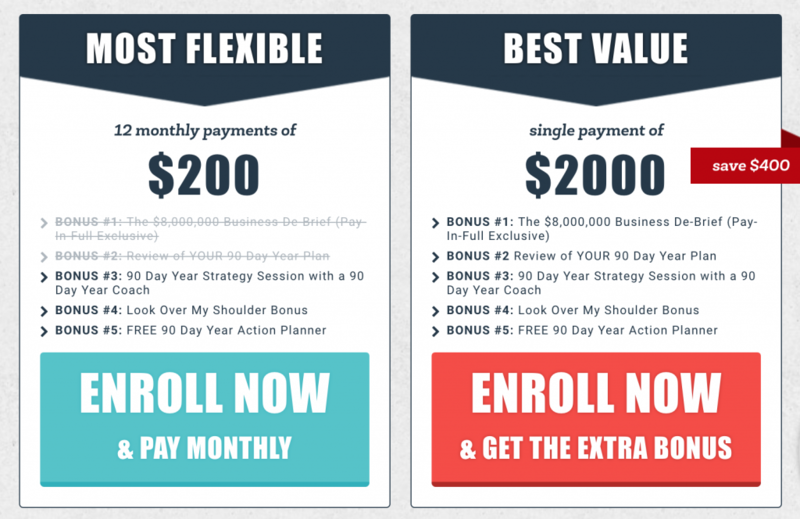 The 90 Day Year program has two investment options. The first is a monthly option of $200 for 12 months. If you were to decide to pay in full, you would save $400 by paying $200. The second option is you can enroll in the 90 Day Year and also get direct private coaching with Todd. This option is very limited and only open to a few students. If you’d like to join the program at the $200 installment option go here. If you’d like to join the program at the discounted one-time investment option go here. Can I Buy the 90 Day Year Planner by itself? First, the word has gotten out at just how awesome the 90 Day Year planner is. That said, Todd has only made this available to those that are already part of the 90 Day Year program because it’s designed to be used hand in hand with the actual program materials. I recently recorded a video about the 90 Day Year planner here. If I’m a member of the 90 Day Year where do I log in to the members area? If you are already a member of the program, you can go to the members login page here. Is there an app to use when I purchase the 90 Day Year? Todd and his team developed a full-fledged 90 Day Year app. And it’s pretty cool too. Once you join you’ll find the details on how to access it right inside your members area. Is Todd Herman Offering Any Bonuses When I Purchase the 90 Day Year? First, remember that Ryan and I are offering you a full bonus package for the 90 Day Year when you join from our affiliate link here. That said, Todd is offering you a number of 90 Day Year Bonuses. Now, this is just the start of what you get as a bonus when you join the 90 Day Year. What I recommend is that you look at the official 90 Day Year website here to see all the 90 Day Year bonus offers you qualify for. Where can I see a full 90 Day Year program reviews? Outside of reading this ultimate guide I created a video review for you to watch. If you prefer you may watch it on YouTube here. How do I know if the 90 Day Year is right for me? This is a great question that you may be thinking about because while the investment in the 90 Day Year program is quite reasonable it’s still a good amount. That said let’s talk about who this program is specifically designed for. The 90 Day Year is really designed for anyone that is looking to get more done in less time. For those that are tired of not getting the results they want. For those that are tired of working around the clock and just not seeing the results, they know they should be achieving. Really the 90 Day year is for those that are looking to become an elite performer in business and life. When will Todd Herman be releasing the first pre-launch video for the 90 Day Year free video series? The first video in the free 90 Day Year video series will be released near the end of May. In the meantime, you can check out the debrief of the pre-pre-launch videos here. How do I download the 90 Day Year Oww vs Wow Brain Cheat Sheet? If you haven’t yet downloaded the Oww vs Wow brain cheat sheet you definitely need to. It’s something that will help you rewire your brain in a matter of a few minutes. I remember the first time I came across it…it was a gamechanger. Here’s the link to download it. **Please note Todd does ask for your email address to access the Oww vs Wow Brain cheat sheet. Do you earn a commission if I buy the 90 Day Year program? So if you use our affiliate link here yes we will earn a commission for your purchase of Todd Herman’s 90 Day Year program. By using our affiliate link it enables us to help cover the costs of our marketing, our team, our overhead, etc and it doesn’t cost you anything extra by the way. In fact, when you buy the 90 Day Year from us you actually get an extra 90 Day Year bonus :-). Does the 90 Day Year Workbook only come in a PDF form or can I fill it out on my computer? Now if you are like me, I prefer to print things out and write on them. There’s just something that makes it feel more real to me. However, if you prefer, you can actually utilize the 90 Day Year workbook on your computer and edit the fields all there. You’ll want to just make sure you save it regularly :). I prefer to print it out and use it that way though. What is the 90 Day Year program? The 90 Day Year program is a training program created by Todd Herman. It’s designed to help you apply the exact same frameworks, models and “mental software” that Olympians, Fortune 100 CEO’s and elite entrepreneurs use to achieve exceptional performance… on command. Overcome procrastination, distraction, and all the other sharp, shiny objects that constantly rip a hole through your momentum. Its designed to help you take daily action with more confidence and clarity… knowing that EVERYTHING you do is perfectly attuned and aligned with the game-changing, ROI-generating outcomes that grow your business. This isn’t about busy work :-). And knowing that as you execute with speed, you have a HUGE advantage over your competition and that NOW, in 90 Days you have the ability to accomplish more than you could in an entire year. What makes the 90 Day Year different from the 12-week year program? The 12 Week Year is a goal-setting process, it’s specifically designed for people that are just needing a framework to set their goals. The 90 Day Year is a high-performance system, and this particular version is meant specifically for business owners. From our experience, most people don’t need that much help with goal-setting. What they need help with is choosing the ‘right goal, right now’ and then having a system to achieve it. That’s what the 90 Day Year system does. Did Todd Herman really win the World’s Greatest Salesman Award? Yes, Todd did, in fact, win the contest that Ad giant Ogilvy’s ‘Search for the World’s Greatest Salesperson’ ran. You can watch his submission here. What if I have a question about ordering the 90 Day Year program? If you have a question there are two ways to get help. You can message Daniel and me through our support desk here. You can reach out to Todd and his team directly through their official website here. [+] how the world’s of entrepreneurship and athletics are similar and why you may have an edge that you don’t even know about. Ready to start executing more in your business? Learn more about Todd’s program right here. Our blog posts may contain affiliate links. That means if you buy something from them we may get paid an affiliate commission for your purchase. Please note that even if we are getting paid an affiliate commission Daniel and I only promote products that we've personally vetted and that we believe in.